A city of Norwich’s size really deserves a better panto than this. 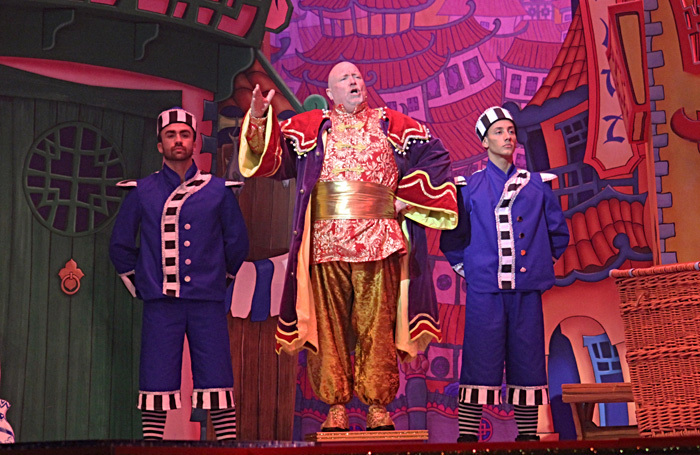 The Theatre Royal’s annual offering – Aladdin this year – looks lacklustre in comparison to its local rivals across the Suffolk border. There’s enough spectacle and song, but where is the energy? Where is the heart and soul? Anna Hannides and Hollyoaks’ Steven Roberts don’t have the charisma to play the central couple – whenever they’re on stage, the energy sags. Channel 5 children’s TV presenter Kiera-Nicole Brennan’s genie doesn’t have much magic about her. And writer-director-dame Richard Gauntlett’s Widow Twankey seems like she would genuinely rather be at the laundrette than on stage. The show only stays afloat thanks to the energetic efforts of Ben Langley’s lovable Wishee Washee (the bit when he gets an audience member up on stage to fix a broken washing machine is the show’s finest moment), Emmerdale’s Rik Makarem’s striding villain Abanazar, and the gaggle of young performers from Norwich’s Central School For Dancing and Performing Arts, who spend most of the show dressed up as pandas. But there’s a lack of spirit across the board. The show designs feel flatpack. The musical numbers – Katy Perry, Take That, and so on – are basic. The special effects don’t amount to much more than a flying carpet and some swirling lasers and the production doesn’t begin to engage with Aladdin’s dodgier elements as a pantomime. Perhaps it’s time people just stopped staging it?